I am struggling to love well. This big dream I shared a few weeks ago that felt like a small dream — to do whatever I do with a heart of love — yeah, it’s probably a big no-duh to you, but it’s hard. And I was right the first time: it’s big. After the retreat high and all the dream talking and the trying to see beauty and accept my human imperfection and receive new mercies, I am worn out. I am limp as the cloth hanging across my sink, as drained as the milk jug that’s dripped its last drop into the bowl of cereal. One, loving is hard work, and so doing it wears me out. Two, I struggle to ask for what I need, which might mean that, even more, I struggle to receive what I need. When I can’t feel the love coming in, I feel the pull of all the love that’s coming out. Let me say: I know that I cannot do life with a heart of love without God living in and through me. I know that opening my home and tending my children and teaching and classroom volunteering, or whatever — it’s all filthy rags, a clanging racket if it is without love, and so I am trying (in messy and imperfect ways) to allow love, and not obligation, to be the foundation and overflow of my doing. And I am trying to soak up God’s words and his encouragement and his adoring and learn what it means to allow Christ to shine straight through my cracks, receiving that it is gift and not failure when he is my strength in weakness. Yet, friends, all this trying, and I still feel wrung dry and confused. In the midst of lots of other stuff that sits in my head bowl with the clarity of fog, I’m starting to think that in my desire to be “used” by God I may have been praying a prayer and thinking a thought that needs a little tweaking. For years, I critiqued and challenged and questioned myself — after parties, coffee dates and times of giving, berated myself with, “Why did you say that?” and “She probably thought that you thought you were ___ .” Incessantly wondering if I were doing enough or serving enough or saying the right thing enough because I wanted more than anything to do and say what was generous and true and right and meaningful. So here’s the thing I’ve been wondering about: while I believe that God desires to use my gifts and yours to bless others and that he does make us blessing, perhaps I would do well to remember that we already are a blessing. And, with this, that we are also made to receive blessing. Every good gift, actually. So today, maybe this is just for me, but perhaps you might need to hear that you are a blessing, formed by the hands of a loving God, imbued with gifts and purpose. Maybe you need to know you’ve got permission to cup those hands and cup that heart to receive the gifts being given by God and others to you, for you. 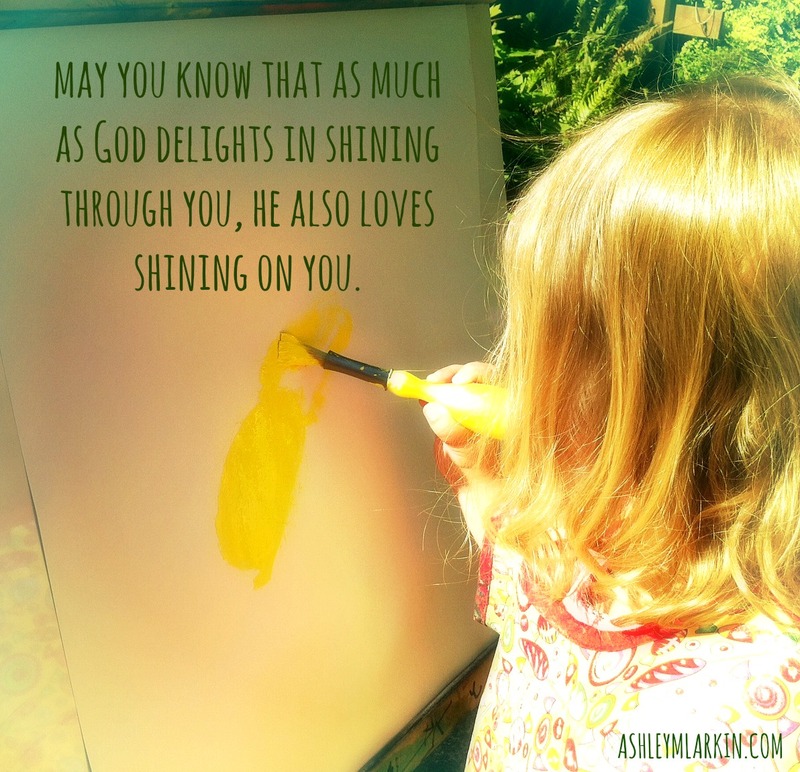 Today, may you know that as much as God delights in shining through you, he also loves shining on you. 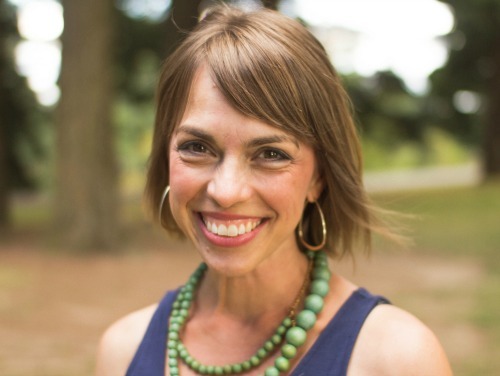 Linking up with Emily Wierenga at Imperfect Prose. I feel you, Ashley. All I want to say is: Me, too! Me, too! We’re church planting and I struggle every single day with pouring out and then having a pity party about not being filled by these people I pour into. I don’t love well. You have said it beautifully- so thank you! Dear Lori, thank you! It is good to know that I am not alone in this…even when we’re doing the good, important work we know we’re being asked to do. May God bless and keep you in tender care as you pour out your love and care to others. I want to tread softly with my reply, dear friend, but please consider the possibility that you might be trying much to hard to love and that is impossible! Learn first to rest in your Pappa and then He will really fill your heart to the brim with the love He has for others! Only He has an unlimited supply of love. Even then, He still remembers that we are really just dust and He knows we cannot physically do everything for everyone! In the Book of Proverbs there is a verse that says, “His boundaries falls in pleasant places”. Don’t you think you need some boundaries, dear one? Dolly, I battled with this for a very long time, even when I was to ill to look after myself, I still pushed myself beyond my limits trying to accommodate others. It was so wrong of me! Please, see this only as my heart filled with love and compassion towards you. I appreciate your love and care, Mia. I am sorry that my words might not have come across clearly, friend. My whole intention here is to say that my love is limited…I feel this very intently. I was also trying to say that I can be trying to receive God’s love and still feel unable to soak it in. I am human after all and am sharing today from that right in the middle place. For me, a big part of it is seeing myself as not only one intended for doing good works, but as one intended to receive the blessing of God’s perfect love. It’s a process. And certainly, I need boundaries, and employ them daily and am growing in this, too, as my husband can attest! :-) But I do believe there are seasons when we are asked to do more than we feel “humanly capable of” (know what I mean? ), and that is when I lean ever more into God’s provision and love. I am so thankful I’m no longer ruled by perfectionism and people-pleasing and striving in that. I’m still sorting it out, though, and it is a journey. For me, I feel spurred on to share with readers my messy becoming because that is much of this life, too. Thank you, honey, for your care and for sharing your walk with me. You have learned much through your difficult journey, and God is doing a good thing in you. I am grateful for you, Mia. I hope you can take this moment, this breath, to close your eyes and feel this light pouring down on you, through you. I love you, precious friend. My prayers for you today are the same, my “me too” sister. May you also know the gift of the love that is yours. You are a gift! i get this, Ash. i’m cut from that same self-critiquing, varsity-team of Christians who get a little tangled up in the place where the idea of how God wants to use us/change us intersects with the idea that God wants to love us. i get the burn out and the let down and the drain. i think you hit it so well here: “we already are a blessing” and “we were also made to receive blessing.” this changes us from the tyranny of the “haves” into our true selves -the needy before Jesus. and what’s that over-used expression? “one beggar telling another beggar where to find bread.” there’s some gold in those words, even if they are a little faded with too many washings. i have resonated with so many of your posts. i wish we had all day and a cuppa joe to sit and talk and talk and talk . . . oh the stories we could tell, yes? Kelli, what a great image….tangled up together on the varsity team. Yeah, it is so hard for me to get my brain around the being changed and being loved piece, too. You so get it…I’d love to sit with you over coffee and share our broken, messy tales. And I’ve never heard of those beggars, but I really relate to the picture today. Thank you, friend. I love you. And I love your words and your heart. Did i ask u if you were going to allume and did you say no. Bc I was going to say I want to hug you now but I guess I can wait until oct. This is my family of origin. Exhausted end drained very busy people. Very. And I was the least accomplished and the least perfectionistic but still had aches and pains. The world pulls. I struggle daily when I don’t push myself. I slowed down a lot!!!! I hear you so so clearly end I have your back. I watched people do ten times in a day what I do. I just pray the lord will show me when to say no and when to say yes and when to just be still and love. I just want the banner not the squeaky gate. I creak end squeak a lot when I am stretched. For me that’s the plumb line. I agree, I want to love well. I love you, Elizabeth. No, I will not be at Allume, but it would be my hope to attend next year, and I can’t tell you how much I’d cherish the opportunity to hug you, sit with you and tell stories. What a great prayer: that “the Lord will show me when to say no and when to say yes and when to just be still and love.” The banner, not the squeaky gate…love this, friend. I feel as though I might be missing the forest for the trees here. There seems to be a lot of emphasis on doing. If we circled all of the “doing” words, and then went back to read again thinking of “being” instead of doing, would that change anything? BE still, dear Ashley. I’m sure you know the old standby, we are human beings not human doings. I definitely hear you, Susan, and I went back and looked at all the “doing” words, and you’re right, there are lots of them here, and yes, emphasizing “being” over “doing,” especially in a culture that elevates doing, changes much. But that’s just what I’m trying to sort through — and in a more messy and transparent way — where does our being meet up with doing? And I know the be still, and it’s the cry of my heart, and sometimes I can rest there. I have grown much in my ability to rest there, and that’s often what I write about. But my struggle — my struggle comes from the tension of what I feel called to do, my passion and my responsibilities and all I’m not sure I’m to do and the longing to slow. In other words, I’m still sorting through the intersection of being and doing, and I think I will be for a long time. It’s been a stretched too thin, weary sort of time for us here, too. My hubs and I, needing a long vacation from ministry and pouring out and giving. It sounds selfish, but Jesus knew well enough that He took time to withdraw from the crowds and all their taking. Anyway, probably more than you want to know, but what we wrote spoke to that weary place in me. Not at all more than I wanted to know, Elizabeth! Thank you for sharing that and reminding me of the wisdom of Jesus, withdrawing from the crowds. Bless you, friend, as you and your husband seek God’s refreshing and care for yourselves in new ways…it’s not selfish at all. Ashley, this is EXACTLY what I needed to hear. I clicked over here from Imperfect Prose, but you are writing exactly how I’m feeling. So drained I couldn’t even make it into work today. So drained I’m not even able to love well. I need to retreat and receive His blessings. Why do we always make it about us doing enough when the point is actually us receiving Him as enough? This is my life long lesson… Thanks for sharing! Thank you for sharing your heart here, Kim. I have been praying for you…that you have been held in those moments of retreat to receive, be refreshed. That needs to be a part of the rhythm of these full days, doesn’t it? I am with you, though –receiving God as enough is such a journey for some of us. Be gentle with yourself, dear Kim. Sending you much love. Your words have lightened my heart today. Thank you. I hope you keep on writing. Connie, I pray that you continue to experience glimpses of light-ening, knowing you are a treasure, a blessing. Cup those hands, girl. Kindy, sweet and dear friend, I cannot tell you how much your words blessed me. You get it, buddy. It feels so good to be gotten by you. I miss you, and I, too, long for lazy days in the sunshine. We’re both right in the middle of the grind. Thank you for reminding me of God’s sufficiency and his delight in me…in us. What an incredible gift. I love you. Blessed to see your face and amen, sweet friend. Thank you so much for you openness & honesty Ashley…life is messy, true love is a challenge, & you are a blessing (to me, your family, friends, readers & everyone your life touches) just by being YOU! Give yourself a chance to breath & let our Lord fill you as you continue to face this crazy last month of the school year! You said it, friend. “Life is messy, true love is a challenge.” I’m thankful for you and grateful for the moments to breathe that I’ve experienced and taken in as a gift this last week. Thank you for blessing me. Though the way has been trying, exhausting, and (i know) so depleting, I adore the conclusion you’ve come to here Ashley. The permission given – to cup, to receive, and to know that you (and we all) ARE already that blessing that we seek and try so hard to be. This has always been true Ash – as much of yourself as you give, or as wildly hilariously fun you can be, to sit or walk beside you, in soft and gentle conversation, or even in hushed quiet, is to know the blessing that you are! Without striving, you simply a r e. I so want you to know how true that is! such love for you my golden girl. Bless you and thank you, Mama. Such a gift those words. I haven’t taken the time to read Draw Near with all that has transpired in my life, yet it was what I needed the most. I lacked the insight to realize that until this morning when I opened up my emails, saw how many I’ve missed, and read “love that drains, love that fills. Your commitment, transparency, thoughts – everything – are an example of blessings waiting to be received. I re-read the first paragraph of “My Grandfathers Blessings” and was reminded of that. Thank you, Ashley. Thank you, Deb. I’m grateful that my processing of mess could bless. Sending you much love. Beautiful! Thank you. I know this struggle all too well. I pray God helps us both to see love from His perspective, because, in my heart, I don’t believe true love gets drained and feels used like I’ve been feeling. I think it just flows from Him to us and on to others. Your post made me realize somewhere I have a dam built up. Praying too that God will remove it. Thanks again for sharing this. I’ve been praying with you, Sarah. I agree with what you say about the flow and understand this dam and echo that I NEED God’s perspective. It’s the only way. Sometimes I just need to repeat that prayer, “Lord, I believe. Help in my unbelief.” Thank you for your presence here, Sarah. Kelly, there are hardly words in reply for I am nodding in understanding and tearing up and thanking God for having skin on and holding you there in your office, for abiding with you in the body of a dear friend. I hear these cries of your heart, these struggles, and friend, I hear, too, the hope as you feel, see and know this true love that isn’t about striving and stalwart and strong. That I can be any help at all in walking the messy of life blesses me. YOU are a blessing, dear friend, and I treasure how you’ve told of your heart places. I am praying for you right now and sending you much, much love. You hit it, girl. I hear your heart in this, and I don’t see you emphasizing doing – I hear the sorting out from a messy, tired, confused middle place, like you said. And I hear the growth, too, and the glimmers of grace filtering through cracks and settling in cupped hands. That message, that we already are the blessing – just by being his, not by doing – it speaks a balm to my own weary, spread-thin heart. Thank you, for being brave and sharing yourself in process. I know how much these stories encourage me that I’m not alone. I’m praying for you, sweetheart, that you would continue to learn that stillness and grace of receiving the Father’s love poured out to overflowing each day. Thank you, dear Amber, for your love and prayer for me — it has been true these last days…some stillness and new grace. Ahh. It’s good to work some of this stuff out, messy and undone though it be, and then receive a gift anew. You’ve ministered so much to me in your honesty and vulnerability, your brave. I love you, friend. Me too, friend. Me too. Feeling it and encouraged by your words. So understand what you are saying here. I have always struggled with the performance end of serving and doing. There is a great quote in One Thousands Gifts that I underlined and * that talks about this “angling for approval” when we serve and not even realizing we are doing it. And of course no other human being can fill us up to our standards. Only God can. You make a such a beautiful and uplifting point that God loves to shine on us, not just through us. Its the difference of Him being a Task Master or a Kind Father that I struggle with. So thankful for your words and heart.